MANISTIQUE, MI--(Marketwire - Nov 1, 2012) - Mackinac Financial Corporation (NASDAQ: MFNC), the bank holding company for mBank (the "Bank"), today announced third quarter 2012 income of $.897 million or $.19 per share compared to net income of $.707 million, or $.21 per share for the third quarter of 2011. Nine month 2012 operating results totaled $5.536 million, or $1.44 per shares, which included a $3.0 million valuation adjustment to the deferred tax asset. Operating results excluding the deferred tax asset for the first nine months of 2012 totaled $2.536 million or $.66 per share compared to $1.566 million or $.46 per share for the same period in 2011. The Corporation's subsidiary mBank recorded net income of $1.329 million for the quarter and $3.577 million, excluding the valuation adjustment to deferred taxes, for the first nine months of this year compared to $2.439 million for the same period in 2011. Total assets of the Corporation at September 30, 2012 were $551.117 million, up 10.53% from the $498.598 million reported at September 30, 2011 and up 10.60% from the $498.311 million of total assets at year-end 2011. Consummation of a common stock rights offering and the investment by Steinhardt Capital Investors, LLLP with the issuance of 2,140,178 shares for net proceeds of $11.500 million. New loan production of $145 million which encompasses all types of originations. 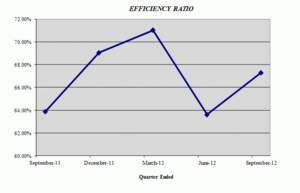 Balance sheet growth equated to $32.7 million this fiscal year and $42 million from the third quarter of 2011. Continued success with the sale of SBA and USDA loan guarantees with sales generating $1.126 million for the first 9 months of the year. Nine month secondary mortgage loan income of $.844 million, compared to $.394 million in the same period of 2011. 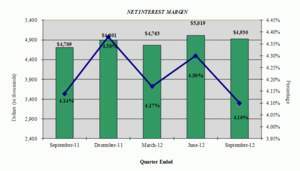 Improved net interest margin at 4.19% compared to 3.95% for the first nine months of 2011. Improved credit quality with a Texas Ratio of 11.26% compared to 24.28% one year ago, with nonperforming assets of $8.801 million in 2012 compared to $14.885 million a year ago. Opening of our new standalone Escanaba branch banking center relocated from an in-store Menards location in August, and also the opening of our new loan production office in Traverse City in September. Both locations are considered core commerce center hubs of their respective markets, where we feel additional client generation avenues will yield long term benefits to maximize the Corporation's value. Total loans at September 30, 2012 were $433.958 million, a 10.73% increase from the $391.903 million at September 30, 2011 and up $32.712 million from year-end 2011 total loans of $401.246 million. The Corporation had total loan production for all loan types of $145 million in the first nine months of this year. Comprising the total production were $73 million in commercial loans, and $72 million in consumer, $67 million of which were mortgages. The Upper Peninsula continues to drive a large majority of the new originations, totaling $93 million, with Southeast Michigan production of $27 million, and the Northern Lower Peninsula with $25 million. Commenting on new loan opportunities, Kelly W. George, President and Chief Executive Officer of mBank, stated, "We are extremely pleased with our success in loan production thus far in 2012. Our loan production has been all encompassing, including new home purchases and refinances, small business expansion and working capital advances, and also a fair amount of loan relationships we have been able to procure from some of our competition. Our balance sheet growth would have been greater considering our production, but we are still experiencing unexpected large loan pay downs as a result of excess cash flow from some of our stronger commercial credits and we have also had some loans that exited the bank due to competitive pricing or loan structures that we felt did not adhere to our policy standards and credit culture. In addition to the $434 million in balance sheet loans, we also have $60 million of SBA/USDA loans and $78 million of secondary market mortgage loans that we have sold but retain servicing on that respectively adds to our totals loans under management of $572 million. The servicing of these loans also provides another source of sustained noninterest income." The Corporation made a concentrated effort several years ago to augment this line of business through some key personnel additions and technology enhancements. These efforts appear to be making a strong foothold as the Corporation is well ahead of 2011 in terms of secondary market mortgage loans produced and sold. Thus far in 2012, the Corporation produced $45.6 million in secondary market mortgage loans compared to $21.6 million in the 2011 nine month period. Gains and fees from secondary mortgage activity totaled $.844 million in 2012 compared to $.394 million in 2011. In addition, the Corporation also received $.121 million in fees on its secondary market servicing portfolio. The Corporation continues to have success in this line of business as in years past with 2012 nine month gains from sales of SBA/USDA guaranteed loan balances amounting to $1.126 million compared to $1.469 million in 2011. Total SBA/USDA loans equated to $19.370 million for the first 9 months of this year compared to $23.806 million in 2011. The servicing of this portfolio generates an additional $.269 million in income for the Corporation. 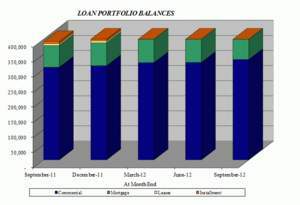 Nonperforming loans totaled $5.290 million, 1.23% of total loans at September 30, 2012 compared to $9.673 million, or 2.47% of total loans at September 30, 2011 and down $2.703 million from December 31, 2011. Nonperforming assets were reduced by $6.084 million from a year ago and stood at 1.60% of total assets equating to $8.801 million. Total loan delinquencies resided at 1.00% or $4.320 million, almost solely made up of non-accrual commercial loans. George, commenting on credit quality, stated, "We are pleased with our continued reduction in the level of nonperforming assets and the overall payment performance on our total loan portfolio which has shown steady improvement since the peak of the economic downturn late in 2008. Our current level of nonperforming assets and associated costs are now more in line with a normal business climate and we annually evaluate the underlying collateral of these assets to maintain appropriate carrying values until disposition. We continue to diligently pursue final resolution of our remaining nonperforming assets and are extremely proactive with customers that may be experiencing some financial stress in order to mitigate new problem assets." 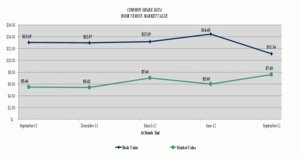 Net interest margin in the first nine months of 2012 increased to $14.712 million, at 4.19%, compared to $13.028 million, or 3.95%, in the same period in 2011. The interest margin increase was largely due to decreased funding costs. George, commenting on margin items, stated, "We expect some margin pressure in future periods from a national economic policy that fosters a low interest rate environment. This has limited investment options and reduced our loan portfolio yields in this prolonged economic cycle. We are experiencing pressure from existing borrowers and with new credit opportunities for longer fixed rate terms and lower variable rate floors. Our challenge is to continue growing our loan portfolio with a balance of fixed and variable rates structured to mitigate long term interest rate risk when an upward movement begins to occur." Total deposits of $439.363 million at September 30, 2012 increased 8.47% from deposits of $405.058 million on September 30, 2011. 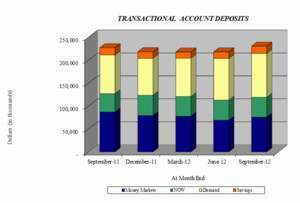 Total deposits on September 30, 2012 were up $34.574 million from year-end 2011 deposits of $404.789 million. The overall increase in deposits for the nine months of 2012 is comprised of an increase in noncore deposits of $10.798 million and increased core deposits of $23.776 million. George, commenting on core deposits, stated, "In 2012 we have continued to experience a good core deposit growth, though lower than in previous years, partially due to proactive rate reductions on deposit products that led to some balance reductions from price driven deposit customers. Our balance sheet liquidity is strong, and we have been able to fund the majority of our balance sheet growth with core deposits." Noninterest income, at $3.060 million in the first nine months of 2012, increased $.129 million from the same period in 2011 which totaled $2.931 million. The largest driver of noninterest income in 2012 was secondary market mortgage activities and gains from SBA/USDA loan sales. Income from secondary mortgage activities totaled $1.136 million in 2012 compared to $.694 million in 2011. SBA/USDA loan sale gains were behind 2011 with year to date gains of $1.126 million compared to 2011 gains of $1.469 million. Noninterest expense, at $12.408 million in the first nine months of 2012, increased $.659 million, or 5.61% from the same period in 2011. Increased expenses were noted in data processing, professional services associated with the divesture auction of our TARP securities and nominal employment costs. The FDIC premiums were reduced by 53.11% in the first nine months of 2012 to $.354 million down from $.755 million in the same period in 2011. George commenting on areas of increased expenses, "We are diligent in our efforts to manage our operating expenses that has been increasingly challenging due to increased overall costs associated with the banking climate, along with an ever changing need for upgrading our technology to stay ahead and thwart cyber/internet fraud while maintaining operational efficiencies." In August, the Corporation consummated the common stock rights offering and the capital investment by Steinhardt Capital Investors, LLLP with the issuance of 2,140,178 shares of common stock for $11.500 million. Total shareholders' equity at September 30, 2012 totaled $72.945 million, compared to $55.479 million on September 30, 2011, an increase of $17.466 million, or 31.48%. Book value of common shareholders' equity was $11.14 per share at September 30, 2012 compared to $13.05 per share at September 30, 2011 and compared to $46.148 million, or $12.97 per share on December 31, 2011. The Corporation and the Bank are both "well-capitalized" with Tier 1 Capital at the Corporation of 11.93% and 9.26% at the Bank. Paul D. Tobias, Chairman and Chief Executive Officer, concluded, "We are proud of our operating results thus far in 2012. We have continued our great success in the generation of new loans and have been able to grow our balances during extremely challenging times. We expect to close the year strong since our pipeline is robust with both balance sheet and secondary market loans. Looking forward, we are positioned well for expansion with our recent capital raise of $11.5 million from our rights offering and the investment from the Steinhardt family. This new capitalization and the access to the capital and the funding that accompany an association with the Steinhardts will be significant catalysts in the execution of our long-term strategic plan for franchise growth and increasing shareholder value." Mackinac Financial Corporation is a registered bank holding company formed under the Bank Holding Company Act of 1956 with assets in excess of $550 million and whose common stock is traded on the NASDAQ stock market as "MFNC." The principal subsidiary of the Corporation is mBank. Headquartered in Manistique, Michigan, mBank has 11 branch locations; seven in the Upper Peninsula, three in the Northern Lower Peninsula and one in Oakland County, Michigan. The Corporation's banking services include commercial lending and treasury management products and services geared toward small to mid-sized businesses, as well as a full array of personal and business deposit products and consumer loans. This release contains certain forward-looking statements. Words such as "anticipates," "believes," "estimates," "expects," "intends," "should," "will," and variations of such words and similar expressions are intended to identify forward-looking statements: as defined by the Private Securities Litigation Reform Act of 1995. These statements reflect management's current beliefs as to expected outcomes of future events and are not guarantees of future performance. These statements involve certain risks, uncertainties and assumptions that are difficult to predict with regard to timing, extent, likelihood, and degree of occurrence. Therefore, actual results and outcomes may materially differ from what may be expressed or forecasted in such forward-looking statements. Factors that could cause a difference include among others: changes in the national and local economies or market conditions; changes in interest rates and banking regulations; the impact of competition from traditional or new sources; and the possibility that anticipated cost savings and revenue enhancements from mergers and acquisitions, bank consolidations, branch closings and other sources may not be fully realized at all or within specified time frames as well as other risks and uncertainties including but not limited to those detailed from time to time in filings of the Company with the Securities and Exchange Commission. These and other factors may cause decisions and actual results to differ materially from current expectations. Mackinac Financial Corporation undertakes no obligation to revise, update, or clarify forward-looking statements to reflect events or conditions after the date of this release.